The Guardian News U.S. Pakistan relations Pakistan's Defense Minister Announces The Suspension Of Intelligence Sharing With The U.S.
Pakistan's Defense Minister Announces The Suspension Of Intelligence Sharing With The U.S.
Pakistan's defence minister Khurram Dastgir Khan has announced that he has suspended intelligence sharing with the US - the latest twist in the US-Pakistan row. But how much does it matter? Relations between Washington and Islamabad have been in the spotlight since US President Donald Trump's New Year's Day tweet, where he accused Pakistan of "lies and deceit". 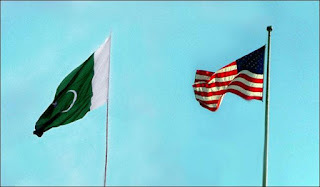 Since then, Washington announced it would halt all security assistance to Pakistan, and Pakistani politicians have been quick to express dismay - with the foreign minister saying that the two aren't allies anymore, and the army chief saying he feels "betrayed". But behind the rhetoric, both sides are actually responding more cautiously than you might expect. WNU Editor: The U.S. and Pakistan intelligence relationship has always been complicated .... The C.I.A.’s Maddening Relationship with Pakistan (Nicholas Schmidle, The New Yorker). But after 16 years with no progress in stopping the safe havens for the Taliban and other militant groups in Pakistan .... the cycle has to be broken. And while I do not know if President Trump's cutting of aid to Pakistan .... and Pakistan suspending the sharing of intelligence with the U.S. .... will in the end make a difference. I do know that there is now a dose of honesty in this relationship, and what both sides do from now on will have real consequences. Regular readers of this blog know that I have never trusted the Pakistanis .... that they have been a playing a double game for years. And as I have mentioned more than once in this blog .... as long as Pakistan keeps heroes like Dr. Shakil Afridi in jail .... The Pakistani Doctor Who Helped The CIA To Find Osama Bin Laden Is Still Languishing In A Pakistani Jail (November 16, 2017) .... they cannot be trusted.